Next to the common cold, ear infections are the most commonly diagnosed childhood illness. Three out of four children will have at least one ear infection by their third birthday. In fact, ear infections are the most common reason parents bring their child to a doctor. An ear infection is an inflammation of the middle ear, usually caused by bacteria, that occurs when fluid builds up behind the eardrum. Anyone can get an ear infection, but children get them more often than adults. The scientific name for an ear infection is otitis media (OM). Doctors try to distinguish between the different forms of otitis because this affects treatment options. Not all forms of otitis need to be treated with antibiotics. Kids eustachian tubes are shorter and more horizontal than those of adults, which allows bacteria and viruses to find their way into the middle ear more easily. Their tubes are also narrower and less stiff, which makes them more prone to blockage. 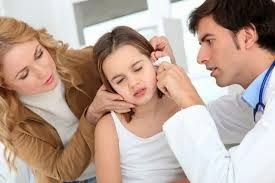 Ear infections also occur more commonly in boys than girls, in kids whose families have a history of ear infections, and during the winter season when upper respiratory tract infections or colds are frequent.